Passengers will soon “see the difference” aboard Airbus A320 Family aircraft with the company’s latest enhancements to this single-aisle product line’s cabin atmosphere. (Airbus) - In continuing its reputation for innovation and commitment to passenger comfort, Airbus is expanding the use of full LED (light emitting diode) cabin lighting – which is incorporated on the next-generation A350 XWB – across its modern product line, starting with the A320 Family. Airbus’ first new-production single-aisle jetliner to feature a full-LED lighting system is an A321, which is designated MS5969 in the company's numbering system. Light emitting diodes offer more colour fidelity and show almost no brightness variation, while allowing for gradual dimming, which results in higher quality lighting for passengers, explained Airbus System Engineer Joerg Hellmuth-Schmidt. “In an A321 you can see 25 metres of lights. If one single unit does not match the others in terms of colour or brightness, you can spot it immediately,” he said. 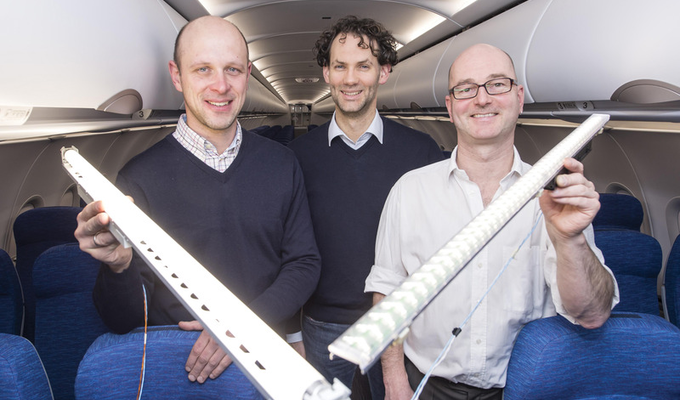 Compared to traditional fluorescent tube lighting, LED technology used in Airbus’ Cabin Light Emitting Diode Units (CLEDUs) reduces weight by 30 per cent, consumes 50 per cent less power, lasts three times longer. Airbus’ interior lighting and A320 Family engineering teams worked in close cooperation with Diehl Aerospace Nürnberg to develop the LED units. Approximately 100 LED units are used to light the cabins of single-aisle aircraft, with each containing up to 45 individual diodes. This technology is planned for A320 Family series production by mid-2014, with the first A380 jetliner receiving LED lighting throughout the cabin this autumn, followed by A330 Family aircraft in 2015. A full-LED lighting system will also be incorporated from the first A350 XWB – which is scheduled for delivery in 2014 to Qatar Airways.